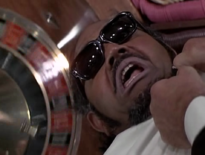 We’d endured the DIAMONDS ARE FOREVER Live Tweet once before. Some of us were glutton for punishment. For others, it was their first time. #DAF had yet to pop their cherry. Jill St. John. Bambi and Thumper. The Moon Buggy. Oh how much fun #DAF could be with good #Bond_age_… so… so… awesomeful. There are worse Bond movies but #DAF is ground zero for all that would go wrong. #DAF Love these guys! They make Ed Gein look like Fred Rogers. @007hertzrumble oh boo! Did not know that. What a rip-off! The earlier films had some chauvinism — it curdles into sexism in #DAF. @007hertzrumble Try saying “bushy” in a Connery accent. #DAF “Bushy Galore”? #DAF William S Burroughs is in this? @007hertzrumble Hell, I would have too! @007hertzrumble #daf oh, God no! #DAF #slow motion prancing astronauts. Do they know there really wasn’t zero gravity. @TRWilcox How bout the Benny Hill theme instead? #DAF This is boring. Bring back the murderous gay couple. #DAF who throws a cat? #DAF Did they dub every voice in this using the actors from the Penelope Pitstop cartoon? “@007hertzrumble: we bring in Jimmy Dean to rescue the film. Misguided? Or maniacal genius? #DAF” genius, but he should have Rolph with him. #DAF for blofeld it was just another Friday night. #DAF Ohhhh this is why he wanted the diamonds. I thought he had a s***load of turntables. #DAF Felix was the weatherman on channel 12 for years before the CIA recruited him. #DAF Blofeld admiring Tiffany’s cheeks is the most unlikely thing in this film. And just when you think #DAF couldn’t enrage you any further, the movie executes the best characters like they were extras on LOVE BOAT.